The firing and hiring gaffe of the General McLane School Board. Nick Swisher, wearing the uniform of another team. THERE WERE TWO travesties I was extremely sure I would never see again in my lifetime: 1. The USA involved in a Viet Nam-type war we could never win. 2. A General McLane School Board firing a boys basketball coach after he had one season under his belt. Wrong again – and again! How hard is it to take an incredibly stupid, ignorant, difficult, pathetic (get the picture?) situation and make it worse? Apparently it's not all that difficult. Just check out the General McLane School Board where politics is the name of the game – and not basketball. The GM School District should have a slogan: "General McLane! Where our athletes come 112th – just behind relatives, friends, and neighbors." Or: "If your little Chipper-Skipper darling isn't playing enough, don't go to the coach; go to a school board member." Or yet another slogan could be: "We aim to please – even if we don't know a basketball from a slice of pizza at Uncle Charlie's." For the uninformed, let me digress to the basic point: the GM board fired coach Brian Schulz after one season, the firing not taking place in February, or March, or April, or May – but in JUNE! Congrats to these adults totally playing politics and ignoring what's correct for the athletes and the hoops program. Why wasn't this done in February – although it should never have occurred – when the season ended? I certainly doubt this particular group was at a MENSA conference for four months. This total disregard for the young people in the district calls for an immediate firing – of the board, not the coach. So, just to make sure everyone is aware, the GM board has no clue as to what they are doing, and the group is not going to hire a new coach until its next meeting – which is scheduled for August. That's another eight weeks, or more, that you can add to this insane situation. Basketball championships are won in the off-season, the off-season being June, July, and August. This is when teams bond, go to camps, attend clinics, have open gym, and scrimmage against other schools – schools that have coaches. This is the ultimate disservice for the Lancer hoopsters, and if I could get involved, I would have these adults arrested for criminal negligence, this bordering on being a criminal act. Hopefully I will be able to attend the school board meeting, as I haven't been to a good circus in many years. And I hope a lot of supporters for Brian Schulz show up, as well people who just want to see the GM athletes get what they are owed. And that is an honorable, capable coach who loves General McLane. Wait! Did I just describe Brian Schulz? What makes this even more intriguing to people not up to speed is the fact Brian Schulz's father, Andy, was his predecessor. And more noteworthy is the fact a GM School Board fired Andy after his initial season with the Lancers. He was ultimately hired back after an outcry at a board meeting by irate players, parents, and fans. Sounds to me like a plan could be developing. It also turns out the players, parents, and fans were totally correct, as Andy Schulz molded the Lancer hoop programs into one of the most successful in the state while posting a blistering mark of 600 wins and 179 losses. He is the all-time winningest boys' BB coach in District 10. Also, the senior Schulz, who went on to coach another 28 years after being "fired," saw his teams earn a state title in 2006-2007, claimed 17 league crowns, and added eight district 10 championships while making a total of four appearances in the state semi-finals. The last quote attributed to the GM School Board from 30 years ago was reported to have been, "Oops!" 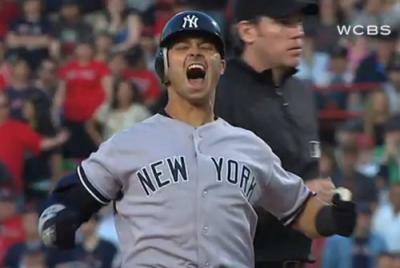 WHEN NICK SWISHER played for the New York Yankees, I can say I really despised him. However, now that my team – the Cleveland Indians – have had "Swishalicious" for more that a year, I can honestly claim: When I see him play, I want to vomit. Fans always throw the phrase around, "So-and-so stinks," but in this case, it couldn't be truer. As a matter of fact, Swisher more than stinks. The self-proclaimed "Brohio" reeks, and he reeks so bad he should be condemned. I always thought he was an overrated phony who pandered to the media and was a total disaster in a big game against good pitching, the statistics backing up my hunch. If you talk to any Yankee fan, they will tell you he couldn't hit a top-three pitcher to save his life but put up better numbers against the lower hurlers in the rotation. Now, he can't even hit the number four and five starters from the opposition. His stats are so poor at this moment that they are actually staggering – on the negative side. Combine this with his atrocious fielding, and Swisher may be the worst athlete in the history of professional sports to make $15,000,000 per season. I honestly believe he needs to have his eyes checked as his vision may've changed as he aged, the Indians free agent developing a blind spot. At best, I was a decent baseball player in Boys Baseball, high school, college, and the Glenwood League, playing 12 years as a first baseman. I can proudly say I never dropped a throw while performing at this position. NEVER! I have seen Swishy drop at least six throws this season alone. This is totally unacceptable for a high school player, let alone someone pocketing $15,000,000 per year. It is borderline unfathomable. He needs to get to an eye doctor pronto. And the news only get worse, Swisher having a contract that guarantees him the same pay for the next two seasons. As far as the Indians go as a whole, they aren't a horrible team, the starting pitching, bullpen, and hitting getting at least a C+ rating, the defense getting a D, and Swish an F-. The Ohio squad should win enough games to contend for a wild-card spot, and that's about the best the team's fans can hope for, meaningful games in July, August, and September. I don't think that's asking for too much. Keep in mind, however, this is an organization that went into the season thinking an over-the-hill Jason Giambi and an incompetent Nick Swisher would carry them to the top. Where is the General McLane School Board when you really need them? MEANWHILE, TAKING A look at the Pittsburgh Pirates, I touted them as one of the best in the National league before the season and stay with them after a slow start. I now feel the Bucs have righted the ship and will be a force the remainder of the season. If the pitching stays healthy, the Bucs can contend for the NL crown, especially with Gregory Polanco looking like the real thing. He is really enjoyable to watch. On a side note, regarding Polanco, a friend of mine approached him when he was playing for the Altoona Curve against the Erie Seawolves and asked him for an autograph. My buddy said he could not have been nicer. And that's always nice to hear. Factoring in the slow start, I will give Bucs a C+, but the arrow is trending upwards. I KNOW SOCCER fans are optimistic about the future of their sport in the USA because of the excitement generated by the World Cup, but I wouldn't get carried away. This is an event that happens once every four years and the entire country gets behind our only team so there is definitely a buzz being created. I even watched some it and rooted for the USA! USA! USA! Then I tried to watch the WC when American was eliminated, and it just wasn't the same. I saw enough 1-0, 2-1 games to last me for a long time. However, I think interest is increasing, not at the rate soccer fanatics are predicting, but I think more young people will be playing the sport, especially with the uncertainty of head injuries from football. I look for more and more parents to push their children toward the pitch and away from the gridiron. With all this being said, football season opens next month on some fronts – American Football!